St Anne�s Church of Ireland is located in Church Street, Dungannon, 100 metres from the main Square of the town. 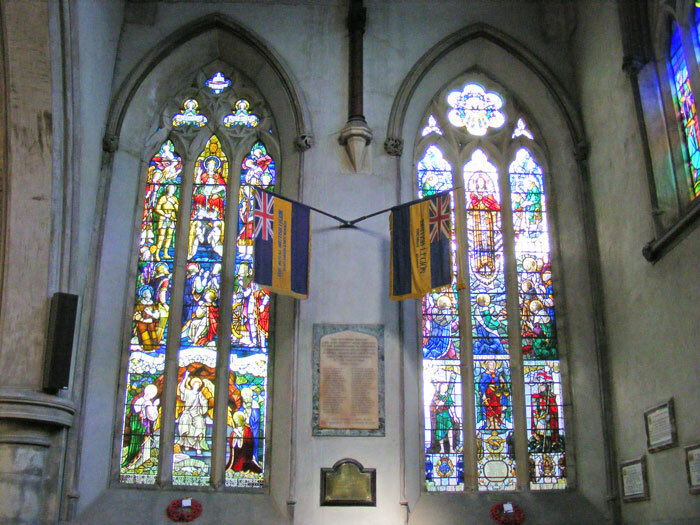 The marble Tablet and stained glass Memorial Window lie in the east transept of the Church. The Table and Window were unveiled in a ceremony on Sunday 19th March 1922. Below are the details of that ceremony. A solemn and impressive ceremony took place in St Anne�s Parish Church on Sunday when a War Memorial Window and Tablets were unveiled and dedicated by his Grace the Lord Primate. A large turnout of ex-service men paraded at the Royal School grounds, and also the Royal School and Church troops of Boy Scouts; all under the command of Major T G H Dickson. M.C., and marched in procession to the Church. The service opened with the singing of the hymn �How Bright Those Glorious Spirits Shine�, and the special lessons were read by Rev Canon McEndoo, M.A., After the singing of the Psalms 23 and 46, Morning Prayer to third Collect was said, and then his Grace performed the unveiling of the beautiful marble Tablet and dedicated it and the handsome stained glass Memorial Window in the east transept of the Church. At the conclusion of the ceremony, during which the congregation remained standing, the Last Post and Reveille was sounded by ex-service men, S Hodgett and W Lecky. The anthem �What are these that are arrayed in white robes� was then effectively rendered. After the singing of the hymn �For all Thy Saints�, Chopin�s �Funeral March� was played on the organ by Miss Farrell. His Grace preached a touching sermon based on the text �Trust ye in the Lord for ever, for in the Lord Jehovah is everlasting strength�, Isaiah 26, verse 4. He referred to the splendid response made by the members of that Church to the call of duty in the Great War. They had sent many volunteers, both men and women to help in the cause of humanity and civilisation. 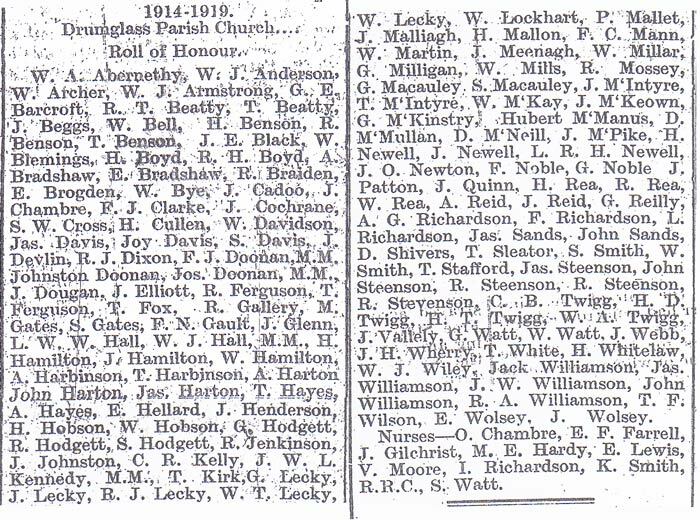 The tablet, which had just been unveiled, contained the name of one heroic nurse, Alicia Watt, Dungannon, who died in the service of her country. 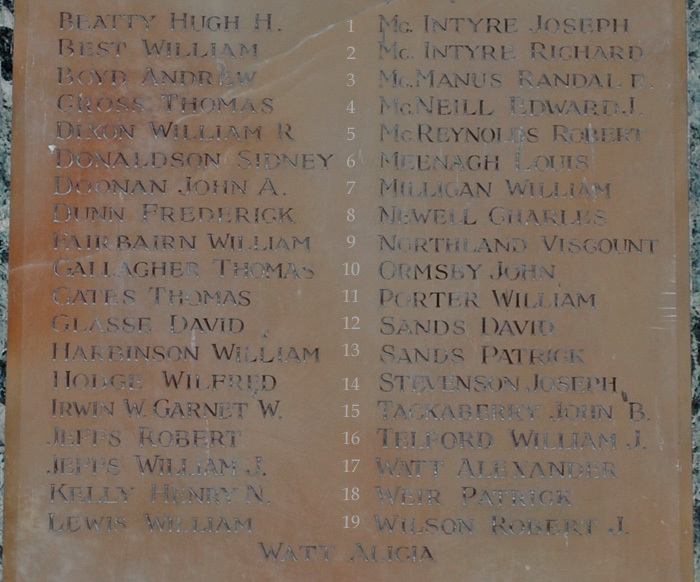 Thirty nine men of the parish who went forth to the war made the supreme sacrifice and their names have been inscribed on the tablet unveiled that morning, and the beautiful memorial window will perpetuate their memory for succeeding generations. The tablet at the main entrance contained 150 names of the men and women of the congregation who had risked their all in the cause of righteousness. 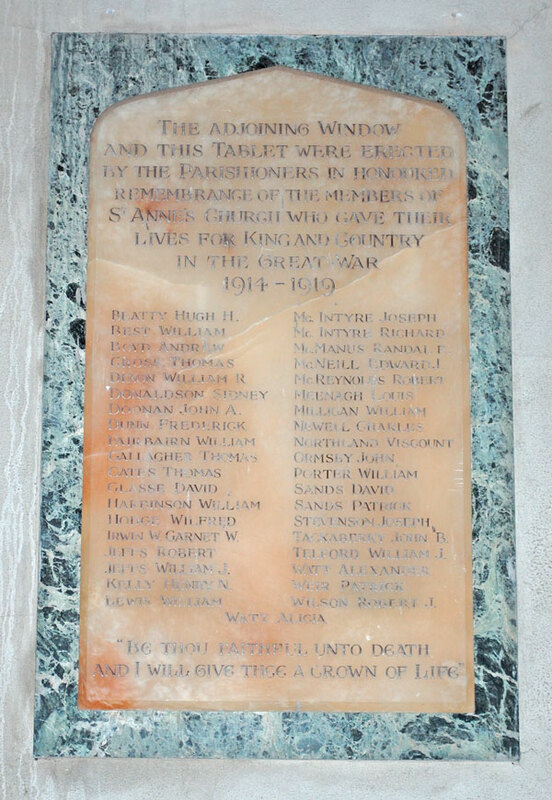 �The adjoining window and this tablet were erected by the Parishioners in honoured remembrance of the members of St Anne�s Church who gave their lives for King and Country in the Great War 1914-1919�. The names are listed above. The work was executed by Messrs. A L Moore and Son, ecclesiastical Art Decorators, St Augustine House, 80 Southampton Row, London.